Located on the leeward side of Mount Cameroon, an active volcano that is 13,255 feet in elevation, Munyenge gets very heavy rainfall, which is propitious for high yields but unfavorable for drying the beans. 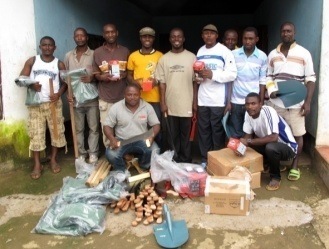 In 2014, the government of Cameroon started a project of distributing dryers to villages, as the rainforest is severely impacted by the current cocoa-drying practices. See the Gallery--Cocoa Drying for a picture of the ovens used in the region. We have visited this village on three occasions--in 2011, 2012, and 2014, and we have donated $1,200.